This weekend, REALTOR® association executives (AEs) from around the country will gather at the 2012 A.E. Institute for a few days of networking, professional development programs, and a chance to learn about key industry trends and issues. As it happens, this year’s conference takes place in Louisville, KY, which makes it a particularly auspicious occasion: 100 years ago in the same city, REALTOR® AEs gathered together for the very first time. Members of the National Association met in Louisville on June 20, 1912, for their fifth annual convention. At this convention, the local and state association secretaries (as AEs were called at the time) for the first time had been allowed two hours to themselves. Around thirty secretaries participated, with R. Bruce Douglas (executive secretary of the National Association from 1909-1911) serving as chairman. The group spent their first hour at the Hotel Watterson, dining on chicken broth, boiled halibut and vanilla ice cream and listening to presentations on topics that would be familiar to AEs today: how to attract new members, ways to get members to attend regular meetings, managing the MLS, and working with the media. The secretaries spent their second hour together enjoying the Ohio River views aboard the steamboat Constitution. The group decided to create a formal organization for board secretaries, and even crafted a constitution while sailing on the Constitution. The stated purpose of the new Association of Secretaries of the National Association of Real Estate Exchanges was “to afford for its members better opportunity for mutual acquaintance and to hold an annual conference.” Dues were set at $1 per year. Since that day in June 1912, the association executives’ group has been a constant and influential presence, strengthening ties between the local, state, and national REALTOR® associations. The organization formed in 1912 has gone through many changes over the years, becoming the Secretaries’ Division in 1923, then the Executive Officers Council in 1958, and finally the Association Executives Committee (AEC) in 1993. 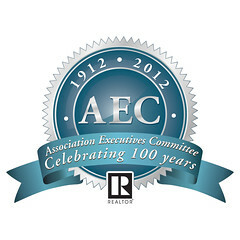 Here’s to a very happy 100th birthday for the AEC, and many more to come. Managing Director of Information Services at the National Association of REALTORS®.